We are proud to release the second ep from the new Fluxion album on Echocord. This work is about his travels in music. The sounds, influences and aesthetic of his actual travels, expectation-journey-destination, alongside the music influences deriving from them. Through his prism those sounds, pictures, travels, emotions left traces of new directions, of future journeys to take." Fluxion captured the "Motion" in his travels with a different feeling each time. “Eruption” is maybe the most powerfull deep dubby track from the Traces album, perfect for the dancefloor. 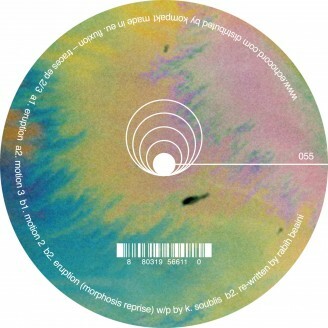 “Motion 3” and “Motion 2” are beautifull floating dubby tracks. Finally Morphosis did a remix of “Eruption”, pure killer madness for the dancefloor. After a decade in the field of dub, techno, ambient, Fluxion opens the horizon with music that cannot fall under one specific territory.